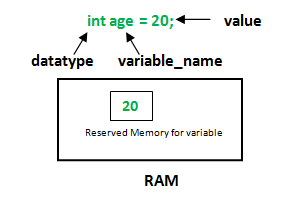 A variable is the name given to a memory location. It is the basic unit of storage in a program. In Java, all the variables must be declared before use. datatype: Type of data that can be stored in this variable. variable_name: Name given to the variable. value: It is the initial value stored in the variable. Let us now learn about each one of these variables in detail. Local Variables: A variable defined within a block or method or constructor is called local variable. These variable are created when the block in entered or the function is called and destroyed after exiting from the block or when the call returns from the function. The scope of these variables exists only within the block in which the variable is declared. i.e. we can access these variable only within that block. Initilisation of Local Variable is Mandatory. In the above program the variable age is local variable to the function StudentAge(). If we use the variable age outside StudentAge() function, the compiler will produce an error as shown in below program. Instance Variables: Instance variables are non-static variables and are declared in a class outside any method, constructor or block. As instance variables are declared in a class, these variables are created when an object of the class is created and destroyed when the object is destroyed. Unlike local variables, we may use access specifiers for instance variables. If we do not specify any access specifier then the default access specifier will be used. Instance Variable can be accessed only by creating objects. //These variables are instance variables. As you can see in the above program the variables, engMarks , mathsMarks , phyMarksare instance variables. In case we have multiple objects as in the above program, each object will have its own copies of instance variables. It is clear from the above output that each object will have its own copy of instance variable. Static Variables: Static variables are also known as Class variables. These variables are declared similarly as instance variables, the difference is that static variables are declared using the static keyword within a class outside any method constructor or block. Unlike instance variables, we can only have one copy of a static variable per class irrespective of how many objects we create. Static variables are created at start of program execution and destroyed automatically when execution ends. If we access the static variable like Instance variable (through object), compiler will show the warning message and it wont hault the program. Compiler will replace the object name to class name automatically. If we access the static variable without classname, Compiler will automatically append the class name. Each object will have its own copy of instance variable whereas We can only have one copy of a static variable per class irrespective of how many objects we create. Changes made in an instance variable using one object will not be reflected in other objects as each object has its own copy of instance variable. In case of static, changes will be reflected in other objects as static variables are common to all object of a class. We can access instance variables through object references and Static Variables can be accessed directly using class name.